July 31, 2017 – This week, our time machine travels back to the twenty-sixth year of Augustus Caesar’s reign, where we’ll sit down for countless scrumptious meals. 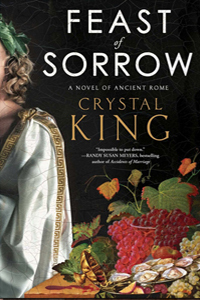 Serving up this unique tale is debut author Crystal King who brings us Feast of Sorrow: A Novel of Ancient Rome . In it we meet infamous gourmet Marcus Gavius Apicius, credited as author of the oldest cookbook known to exist. I packed a lot of history into the recipes when I wrote Regional Greek Cooking, so Crystal’s idea made my stomach growl when it landed on my plate. Readers seem to agree, with Barnes & Noble naming it one of their 8 Fictional Beach Reads for Foodies. Crystal has taught writing, creativity and social media at UMass Boston, Boston University, Mass College of Art, and Harvard Extension School. She also teaches classes on social media for authors at Grub Street. Hungry for seconds after Feast of Sorrow? Look forward to her serving up a second novel that’s in the oven right now: The Secret Chef, featuring famous Italian Renaissance chef, Bartolomeo Scappi. Visit CrystalKing.com, follow our guest @CrystalLyn on Twitter, or toss her a like at Facebook.com/CrystalLynKing.